The item Action philosophers, written by Fred Van Lente ; illustrated by Ryan Dunlavey, (electronic resource) represents a specific, individual, material embodiment of a distinct intellectual or artistic creation found in Kent District Library. This ain't your grandpappy's dusty old philosophy class! It's the philosophy seminar your college ethics professor wished he could teach! 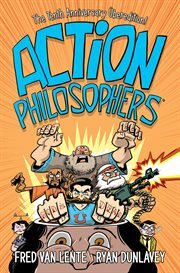 It's...the definitive tenth-anniversary edition of Fred Van Lente and Ryan Dunlavey's award-winning, best-selling Action Philosophers! Study the tenets of Plato, the wrestling superstar from ancient Greece, learn the lessons of Nietzsche, the original ubermensch, and meditate on the messages of Bodhidharma, a kung fu master. Laugh, learn, laugh some more, and ponder the messages of history's great thinkers as Van Lente and Dunlavey deliver this comprehensive cartoon history from the pre-Socratics to Jacques Derrida!